Hanukkah is a Jewish holiday which celebrates the victory of the Maccabees over the larger Assyrian army. It also celebrates a miracle that happened during this time, where just a day's supply of oil allowed the menorah in the rededicated Temple in Jerusalem to remain lit for eight days. Therefore, Jewish people celebrate Hanukkah for eight days. Hanukkah begins on the 25th day of Kislev according to the Hebrew calendar. Hanukkah begins in late November or December. In 2018 it starts on December 3. The Hebrew word hanukkah means rededication. 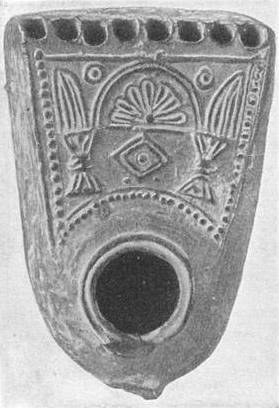 The hanukiah (or hanukkah menorah) is an important Hanukkah candle holder. It has nine candles. Traditionally, one candle is separated from the rest, usually by being higher than the other eight. On the first night, only one candle is lit, on the right side of the hanukiah. On the second night, a second candle is added, and they are lit from right to left,. This continues for all eight nights. The candles are never lit directly - instead, the higher candle, (called a shamash, meaning "attendant") is lit first, and then used to light the rest of the candles. Before the candles are lit, blessings are said over them. Jewish children often play a game called dreidel. The dreidel is a four-sided spinning top, each side having a Hebrew letter. The fire letters (nun, gimel, hey, shin) stand for the Hebrew phrase, "Nes gadol Haiya shaam," meaning, "A great miracle happened there." In Israel, by contrast, the dreidel reads "Po" instead of "shaam," meaning "here." So in Israel the phrase is, "a great miracle happened here." Approximately 2,200 years ago, there was a war between the Greeks and the Jews. The Greeks won and forced their culture on the Jews. A group of Jewish people called the Maccabees revolted and liberated Jerusalem. The Maccabees found their Temple defiled. They sought to rededicate it to God, as the Greeks had been worshipping Zeus there. As part of the rededication, they needed to relight the menorah, whose source of fuel was olive oil. According to the Talmud, the Jewish people only found a single jar of undefiled oil, and that oil was only enough to last a single day. The Jewish people took a leap of faith and relit the menorah. To their surprise, the menorah stayed lit for eight days, which was seven more days than they expected. The Jewish people attributed the surprising amount of time that the oil lasted to God (a miracle). Hanukkah is an eight-day celebration, and each day commemorates each day that the oil lasted. On each day, a branch of the nine-branch Hanukkah menorah is lit with the shamash ("helper" candle), which sits on the middle branch. A large number of songs have been written on Hanukkah themes, perhaps more so than for any other Jewish holiday. Some of the best known are "Ma'oz Tzur" (Rock of Ages), "Latke'le Latke'le" (Yiddish song about cooking Latkes), "Hanukkiah Li Yesh" ("I Have a Hanukkah Menorah"), "Ocho Kandelikas" ("Eight Little Candles"), "Kad Katan" ("A Small Jug"), "S'vivon Sov Sov Sov" ("Dreidel, Spin and Spin"), "Haneirot Halolu" ("These Candles which we light"), "Mi Yimalel" ("Who can Retell") and "Ner Li, Ner Li" ("I have a Candle"). Among the most well known songs in English-speaking countries are "Dreidel, Dreidel, Dreidel" and "Oh Chanukah". Among the Rebbes of the Nadvorna Hasidic dynasty, it is customary for the Rebbes to play violin after the menorah is lit. Penina Moise's Hannukah Hymn published in the 1842 Hymns Written for the Use of Hebrew Congregations was instrumental in the beginning of Americanization of Hanukkah. Potato latke frying in hot olive oil. There is a custom of eating foods fried or baked in oil (preferably olive oil) to commemorate the miracle of a small flask of oil keeping the Second Temple's Menorah alight for eight days. Traditional foods include potato pancakes, known as latkes in Yiddish, especially among Ashkenazi families. Sephardi, Polish, and Israeli families eat jam-filled doughnuts (Yiddish: פאנטשקעס pontshkes), bimuelos (fritters) and sufganiyot which are deep-fried in oil. Hungarian Jews eat cheese pancakes known as "cheese latkes". Latkes are not popular in Israel, having been largely replaced by sufganiyot due to local economic factors, convenience and the influence of trade unions. Bakeries in Israel have popularized many new types of fillings for sufganiyot besides the traditional strawberry jelly filling, including chocolate cream, vanilla cream, caramel, cappuccino and others. In recent years, downsized, "mini" sufganiyot containing half the calories of the regular, 400-to-600-calorie version, have become popular. Rabbinic literature also records a tradition of eating cheese and other dairy products during Hanukkah. This custom, as mentioned above, commemorates the heroism of Judith during the Babylonian captivity of the Jews and reminds us that women also played an important role in the events of Hanukkah. The deuterocanonical book of Judith (Yehudit or Yehudis in Hebrew), which is not part of the Tanakh, records that Holofernes, an Assyrian general, had surrounded the village of Bethulia as part of his campaign to conquer Judea. After intense fighting, the water supply of the Jews was cut off and the situation became desperate. Judith, a pious widow, told the city leaders that she had a plan to save the city. Judith went to the Assyrian camps and pretended to surrender. She met Holofernes, who was smitten by her beauty. She went back to his tent with him, where she plied him with cheese and wine. When he fell into a drunken sleep, Judith beheaded him and escaped from the camp, taking the severed head with her (the beheading of Holofernes by Judith has historically been a popular theme in art). When Holofernes' soldiers found his corpse, they were overcome with fear; the Jews, on the other hand, were emboldened and launched a successful counterattack. The town was saved, and the Assyrians defeated. Roast goose has historically been a traditional Hanukkah food among Eastern European and American Jews, although the custom has declined in recent decades. After lighting the candles, it is customary to play (or spin) the dreidel. The dreidel, or sevivon in Hebrew, is a four-sided spinning top that children play with during Hanukkah. Each side is imprinted with a Hebrew letter which is an abbreviation for the Hebrew words נס גדול היה שם (Nes Gadol Haya Sham, "A great miracle happened there"), referring to the miracle of the oil that took place in the Beit Hamikdash. On dreidels sold in Israel, the fourth side is inscribed with the letter פ (Pe), rendering the acronym נס גדול היה פה (Nes Gadol Haya Po, "A great miracle happened here"), referring to the fact that the miracle occurred in the land of Israel, although this is a relatively recent innovation. Stores in Haredi neighborhoods sell the traditional Shin dreidels as well, because they understand "there" to refer to the Temple and not the entire Land of Israel, and because the Hasidic Masters ascribe significance to the traditional letters. 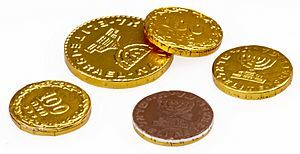 Chanukkah gelt (Yiddish for "Chanukkah money") known in Israel by the Hebrew translation dmei Hanukkah, is often distributed to children during the festival of Hanukkah. The giving of Hanukkah gelt also adds to the holiday excitement. The amount is usually in small coins, although grandparents or relatives may give larger sums. The tradition of giving Chanukah gelt dates back to a long-standing East European custom of children presenting their teachers with a small sum of money at this time of year as a token of gratitude. One minhag favors the fifth night of Hanukkah for giving Hanukkah gelt. Unlike the other nights of Hanukkah, the fifth does not ever fall on the Shabbat, hence never conflicting with the Halachic injunction against handling money on the Shabbat. 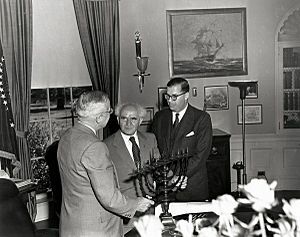 President Harry S. Truman (left, back turned to camera) in the Oval Office, receiving a Hanukkah Menorah as a gift from the Prime Minister of Israel, David Ben-Gurion (center). To the right is Abba Eban, the Ambassador of Israel to the United States. The United States has a history of recognizing and celebrating Hanukkah in a number of ways. The earliest Hanukkah link with the White House occurred in 1951 when Israeli Prime Minister David Ben-Gurion presented United States President Harry Truman with a Hanukkah Menorah. 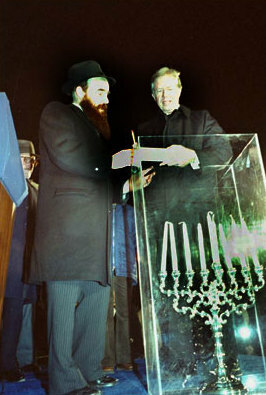 In 1979 president Jimmy Carter took part in the first public Hanukkah candle-lighting ceremony of the National Menorah held across the White House lawn. In 1989, President George H.W. Bush displayed a menorah in the White House. In 1993, President Bill Clinton invited a group of schoolchildren to the Oval Office for a small ceremony. The United States Postal Service has released several Hanukkah-themed postage stamps. In 1996 the United States Postal Service (USPS) issued a 32 cent Hanukkah stamp as a joint issue with Israel. In 2004 after 8 years of reissuing the menorah design, the USPS issued a dreidel design for the Hanukkah stamp. The dreidel design was used through 2008. In 2009 a Hanukkah stamp was issued with a design featured a photograph of a menorah with nine lit candles. The dates of Hanukkah are determined by the Hebrew calendar. Hanukkah begins at the 25th day of Kislev and concludes on the 2nd or 3rd day of Tevet (Kislev can have 29 or 30 days). The Jewish day begins at sunset. Hanukkah begins at sunset of the date listed. Hanukkah Facts for Kids. Kiddle Encyclopedia.